One month left until Halloween! I don't have a mantel to decorate for the occasion and I'm not extremely fond of pumpkins. So what to do, what to do? 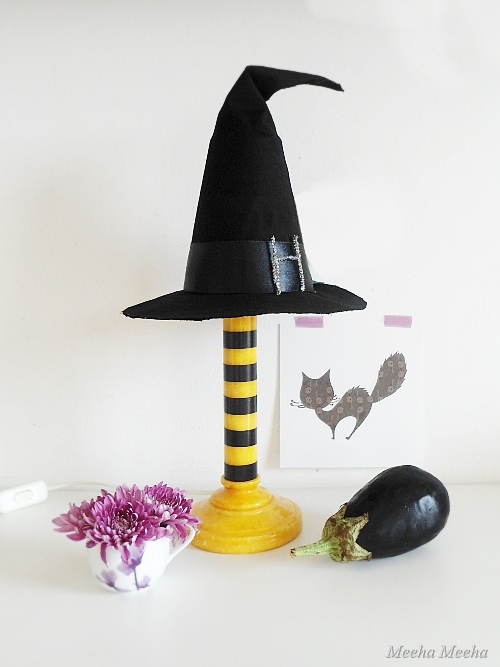 A little witch lamp, of course! It's black like a real witch and it's got witch stockings, too :)) I used an old Ikea lampshade for the top and a yellow base from the gay lamp for the bottom. Oh, I also drew and decoupaged the Halloween spooked cat. In order to decoupage the Halloween cat, I used an ironic patterned paper covered in... other cats:)) And we ate the eggplant the next day (grilled with mushrooms and onions). 1. 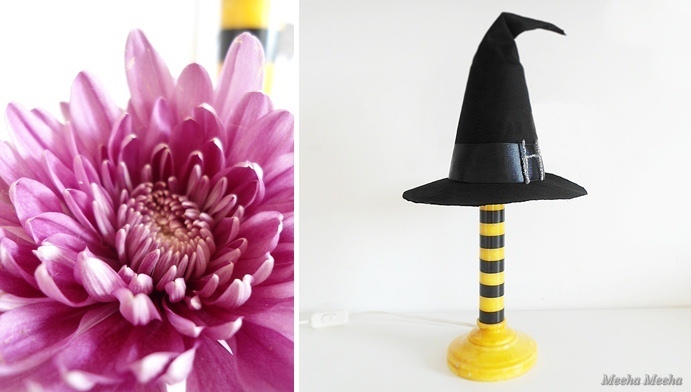 Take a lampshade that is two sizes smaller than the final size you want for the witch lamp. 2. Draw the outline of the lampshade's circular base on a piece of cardboard or thick paper. 3. 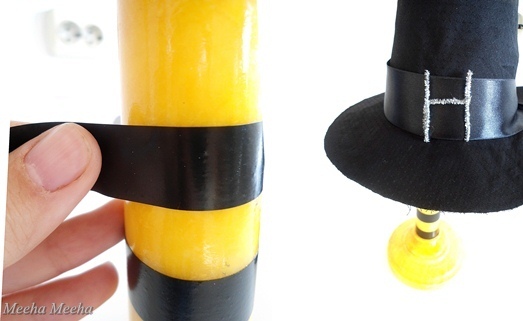 Draw a wider circle (for the witch hat's brim) and a smaller one (for the section where you glue the hat together). Cut on the outer lines. You should be left with a wide cardboard circle. 4. Cut little "teeth" on the narrow section of the circle, to connect the cone and the brim. 5. Glue black fabric on both sides of the cardboard circle. Use a textile glue, it's more resistant. 6. Cut the fabric and fold the "teeth" perpendicularly. You should now have a wide black circle - the brim. 7. Cut a large triangle from the same fabric you used for the brim. 8. Wrap the fabric around the lampshade, make a cone and glue it all together. 9. Put the cone on top of the brim, with the teeth inside the lampshade. Glue the brim to the top (I used flat paper tape, because I might wanna re-use the old lampshade once again). 11. Add a ribbon on the hat, an "H" as a buckle and the witch lamp is done! PS: Could you please spare a vote? Pretty please? I do have a shameless request. If you like my happy entryway, could you please vote for it on Apartment Therapy's Room For Color contest? I am participating in the "International" category and if I am the lucky winner I will receive a certificate of recognition (!!!) and a collection of signed Apartment Therapy books. Thank you in advance for the support (and yes, you need to sign in on Apartment Therapy's website if you don't have an account already, so don't be upset with me and let it go if it gives you too much trouble). Thanks again! Good news, everyone! 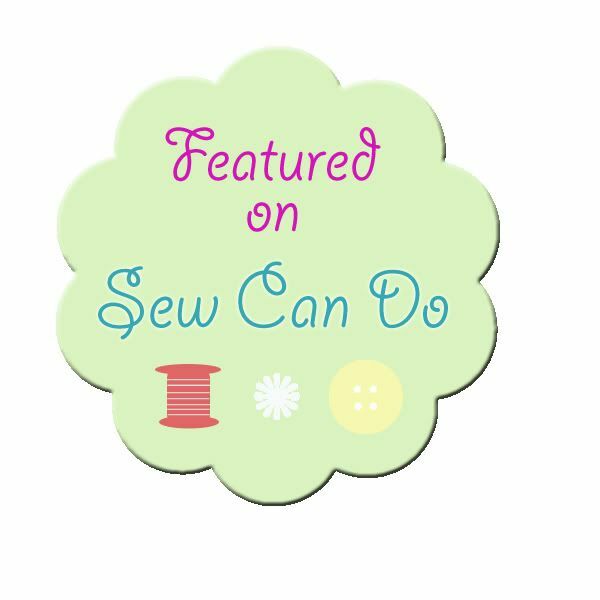 The witch lamp has been featured at A Night Owl, The 36th Avenue, Family Ever After, Craft Envy, Sew Can Do, Crayonfreckles, Blueberry Craft and Hobby Time, The NY Melrose Family, Confetti Diaries, Made In A Day, Navy Wifey Peters and Sugar Bee Crafts. Thank you for the support, lovely ladies! what an idea! i loove it! congatulations on your feature! well deserved! This is adorable! Such a fun idea for Halloween! How cute. I love how your cat is covered in cats! What a fun idea! I love this and my kids would love to see this for the holidays. Thanks so much for sharing! This is so cute! So fun and festive. I hope you will link this up to my Wickedly Creative Halloween Ideas Party if you haven't already. Lauren, thanks a million for making time to visit... and for the pin! I love your lamp ... great idea! This is too cute!!! Great job, I love it. Thanks for the pin - the lamp is quite fun to do! This is SO SO SO cute. I love it! So cute, what a fun idea. 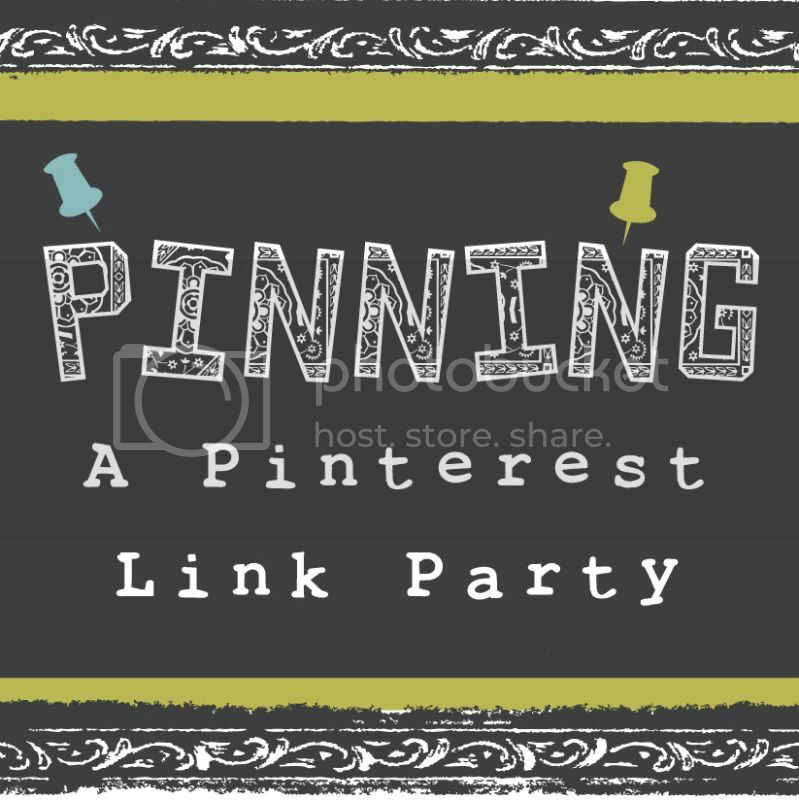 If you get a chance I would love for you to come link up at our Halloween Edition Pin Party. wow, you're getting ready for Halloween already! That is the best lamp EVER!!! You are so clever! I love your lamp! Too cute!! Thank you so much for visiting, the witch lamp is really fun to make! Oh that is such a fun idea! It looks great! Jill, thank you so much for making time to visit the link-ups! I think I just saw the light. Literally. I can score a lamp in the charity shop for a few quid (including shade), so I can make one for the kids, one for the bedroom and one for the living room without breaking the bank. Which is good, because I need LOTS of these lamps in my life, and NOT just for Hallowe'en! i love it!!! the stripes on it are perfect! thanks so much for linking up to tip-toe thru tuesday. Thank you so much for visiting, Maureen! I'm so happy you like the little witch lamp, Joy! Great way to add just a touch of Halloween to your decor! Thanks for sharing! Thank you so much for visiting the little witch lamp, Kimberly! Thank you for the pin, Jaimee! LOVE the witch hat!!!! Very pretty! Thank you so much for the visit and the kind words, Christine! Thanks a million, Desiree, you've just made my day! Big hug! Very clever - this looks fantastic!! Thanks for linking up at Romance on a dime. Thank you so much for making time to visit the witch lamp, Betsy! Fabulous lamp! I'd love for you to share this at my new linky party, Submarine Sunday. I hope you'll stop by! perfect project for the season!! Thanks for linking up at Submarine Sunday! Love your lamp what a creative Halloween decoration! Thanks for sharing it on A Crafty Soiree! Katie, I'm so happy that you like the witch lamp - thank you for visiting the link-ups, as usual! I featured your fabulous lamp today! Thanks for linking up! Hey Holly! Just stopping by to let you know that I featured your fabulous lamp at my Submarine Sunday link party! Stop by to grab a feature button! 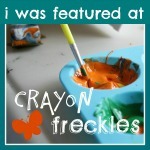 :-) Thanks for linking up last week, and I'll hope you'll link up again this week! Have a great Sunday! What an ingenious idea! I LOVE it!